Consortium Luxembourg is pleased to announce that we are now offering access to the Oxford English Dictionary ! The Oxford English Dictionary (OED) is widely regarded as the accepted authority on the English language. It is an unsurpassed guide to the meaning, history, and pronunciation of more than 600,000 words, past and present, from across the English-speaking world. As a historical dictionary, the OED focuses not only on the meanings of the word, but also on the history of the word, and how its meaning has changed over time. 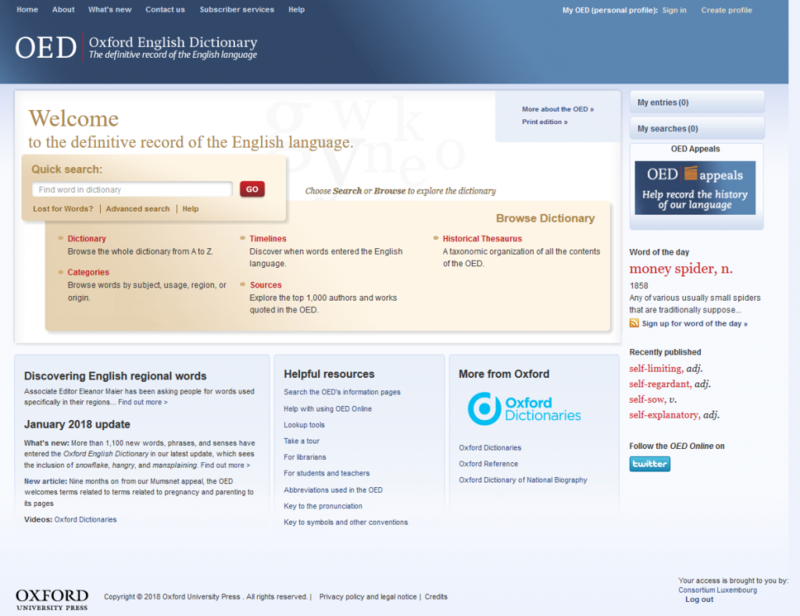 The OED traces the history of the English language through 3 million quotations, from classic literature and specialist periodicals, to films scripts and cookery books. Updates revise and extend the OED at regular intervals, each time subtly adjusting our image of the English language. For more information on the content you have access to, please click here. Take a tour of the product and learn how its user friendly functionality can help you organize and manage your research journey.